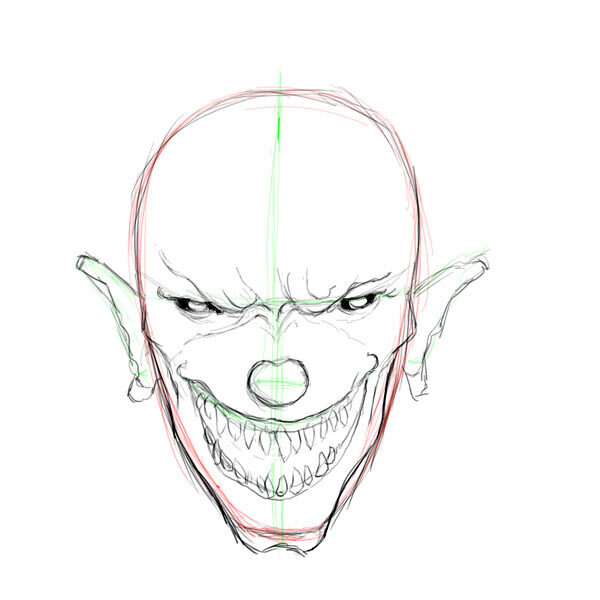 Learn how to draw an evil clown face with this stunningly easy (and scary) step by step tutorial! 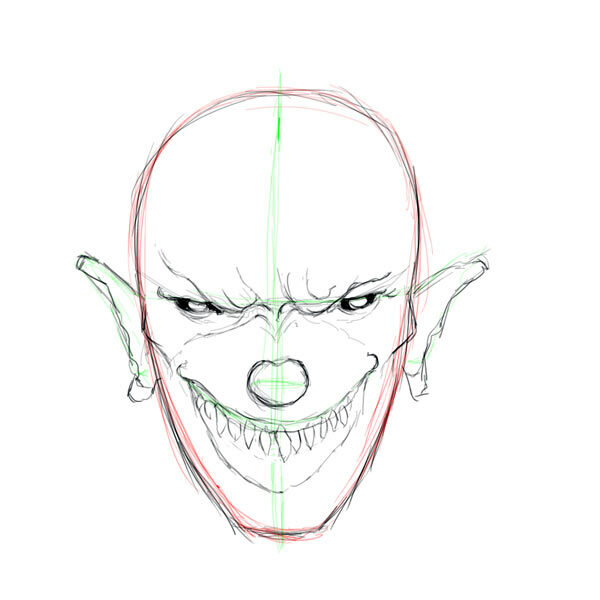 Evil clown drawings is what you have been asking for and it is exactly what I am going to deliver with this shiny tutorial on the Drawing Factory. Be advised though, the final drawing is super scary and not for the faint of heart. So my friends, pick up your pencil, a few colours and your bravery with you because you are going to need it by the end of the tutorial. The whole drawing is also present as a Video Tutorial both at the end of the page and on the Drawing Factory channel on You Tube. Let’s start drawing! As usual the first thing you should do is establishing the principal forms of the drawing. 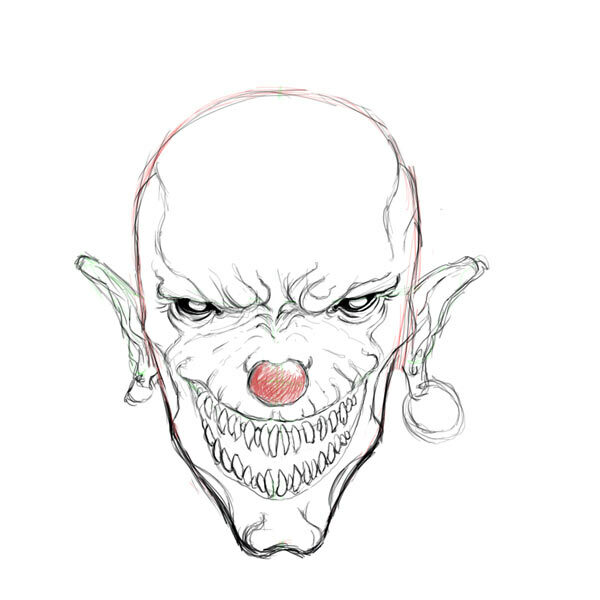 In this case I have realized in red the general shape of the head of the clown and in green the basic drawing lines that will help us position eyes, nose and mouth of the clown. 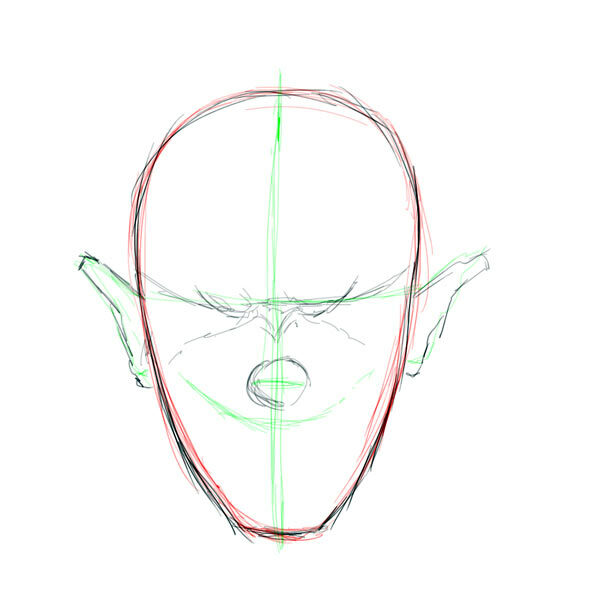 This is not going to be a realistic drawing so it is not imperative that you follow the basic rules for the setup of a face. Eye’s line can be a bit higher than the middle of the face and the mouth abnormally large. 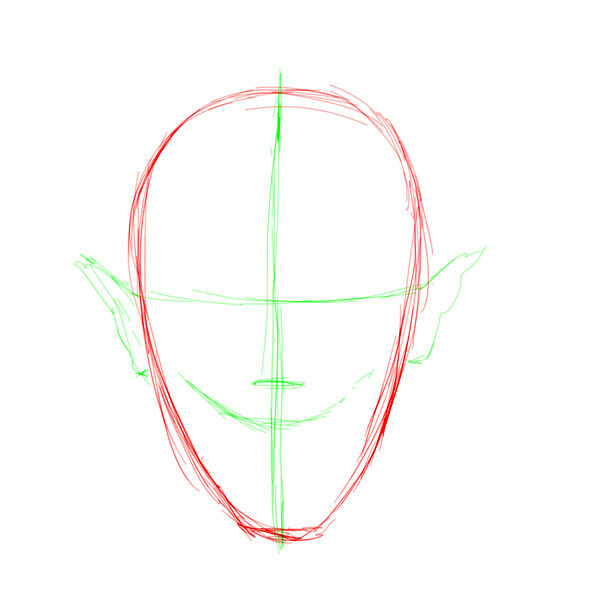 I have also sketched the ears, not really human ears! In this next step we are just going to add eyebrows and the round nose (could it be a clown without it?). I am also using a black marker to trace over the construction lines. My suggestion is not to rush though these first steps. This is a very important step and one that is crucial to give to your clown that evil gaze. Have you noticed how I have drawn the eyes apart from each other? They are smaller than they should be if you were trying to build a regular face and positioned dramatically apart from each other. This small trick gives the clown his evil and eerie look. OK now our clown is starting to look evil already! I have worked at the eye and the mouth. I have added a row of twisted teeth as you might have noticed, I am going to correct them later but I hope you get the point here. Try to keep your drawing always fluid, review it constantly and check if you like what is coming out. In this step we are going to define the jaw line of the clown and the lower mouth. If you compare the previous drawing to this one you’ll notice that the previous one has a much softer appearance. This is due to the rounded shape of the chin. By re-shaping the jaw line we have given to our clown a much harder and imposing aspect. 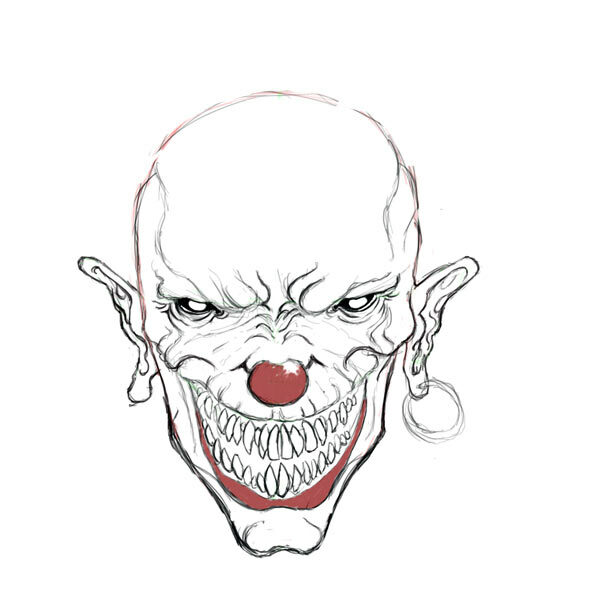 In this step I have reworked the mouth and teeth a little bit and added a fair amount of wrincles to the clown face. The wrincles serve two purposes: the first is suggesting the contraction of the face that is deformed by an evil kind of laugh; the second is to give the face a bit of depth and a touch of realism which increases the scary effect. Nose become reddish if you haven’t noticed. Now is a good time to take a breath and give a solid look to your creation to see if it needs something particular to make it better. It is also a good time to start cleaning the drawing and start define more clearly the lines that you want in your drawings and those that you do not want in. I have noticed for example that my scary friend needed a prominent lower lip and a conspicuous ear-ring! Teeth have undergone also a review. I realised they were not big enough so I have partially redrawn them. We are almost there my f(r)iends! I was quite happy with the drawing so far (and you should be too if you have followed the steps!) 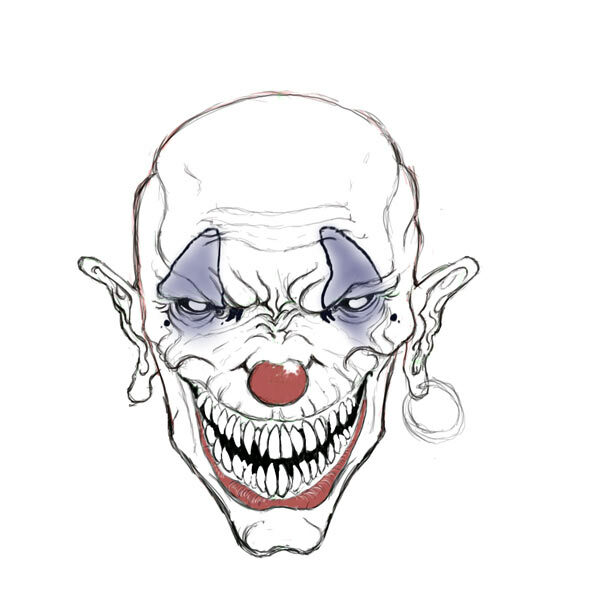 and I decided it was a good time to give our pale scary friend a bit of clownish coloration. In this case I ask you to explore different solutions to that I have used for my evil clown. 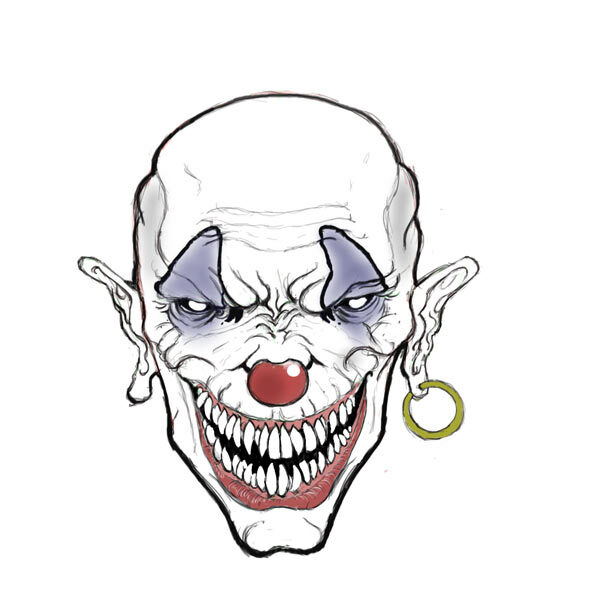 Search the internet and find clown make-ups, put them on your drawing and make your evil clown perfect. With the next and last step we will finish the drawing that, honestly, does not need very much to look perfectly scary. I will just define the contour better and colour the ear-ring. I hope you had fun drawing this evil clown!